My son wanted an Angry Bird cake for his birthday...This is my first attempt working with modeling chocolate over fondant, I was surprised how easy it was to make and how much easier it is to work with than fondant. The cake base is a 2 layer chocolate devils food with butter-creme frosting. It was made white but air-brushed with gel colors mixed with rum and sprayed. The main structure (castle) is a rice crispy treat (rice cereal and marshmallow) base covered with modeling chocolate to look like the Angry Bird castle. It was a grey base and then air-brushed with darker black highlight to make the castle look more dimensional. 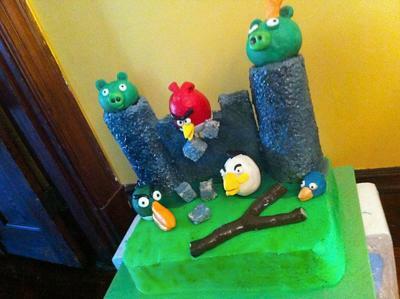 The Angry Birds are also rice crispy treat covered with colored modeling chocolate and some accents with Tootsie Rolls. The castle and birds are held on with bamboo sticks.